Sean: People travel to Orlando for large resorts and parks like Walt Disney World, Universal Orlando, and SeaWorld Orlando, but what makes Orlando such a great region after the major parks close for the day? 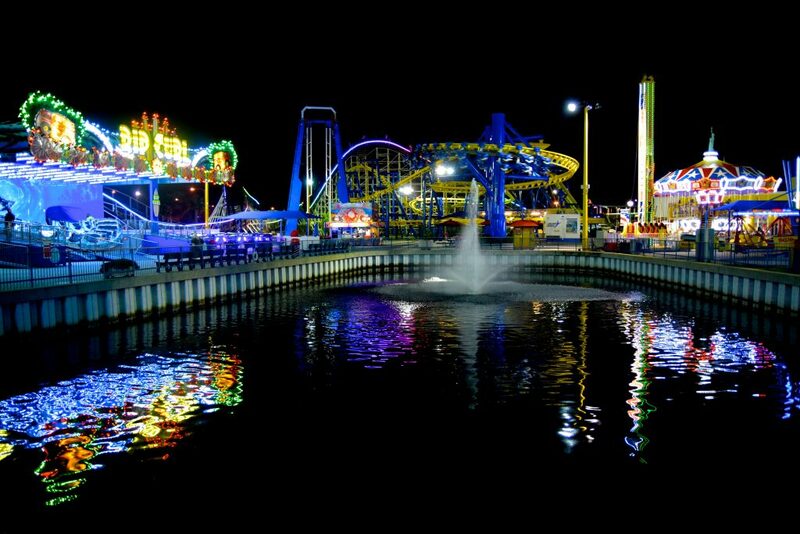 Fun Spot America! 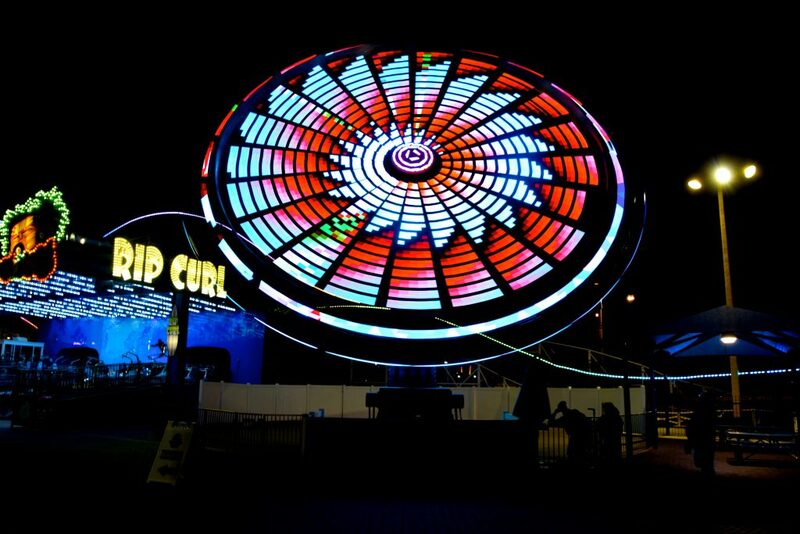 These new smaller amusement parks offer clean, laid back, and thrilling fun. 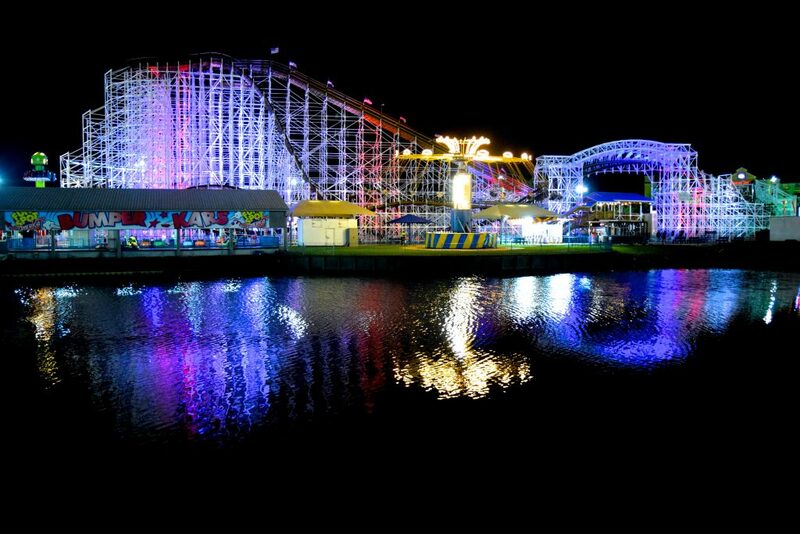 As we were in the region we decided to check out the smaller parks that people may some times forget about, Fun Spot America in Kissimmee and Fun Spot America in Orlando! SeaWorld closed at 6pm and we immediately booked it to Fun Spot Kissimee, we were so excited to check out Mine Blower and the beautiful little nightlife town that is Old Town! 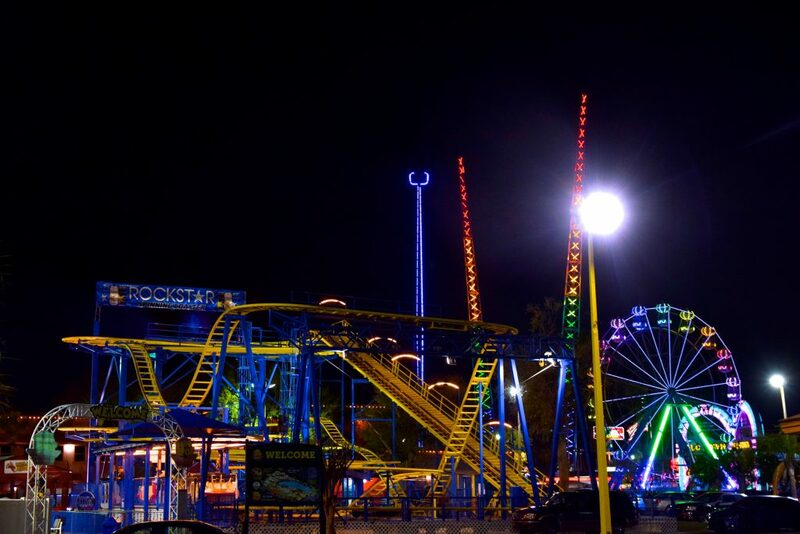 Upon arrival we were welcomed by lots of great light packages and the park’s previous star-coaster: Rockstar! Let’s head in! 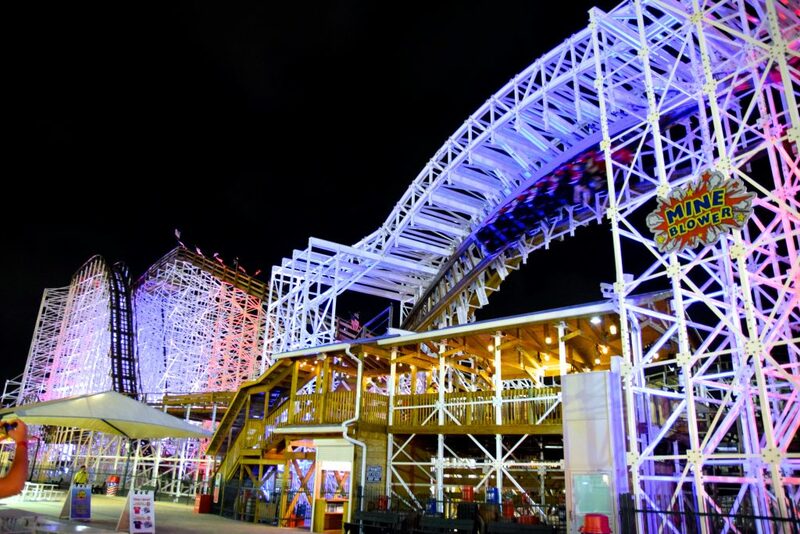 Of course we made sure to check out the new Gravity Group woodie first! 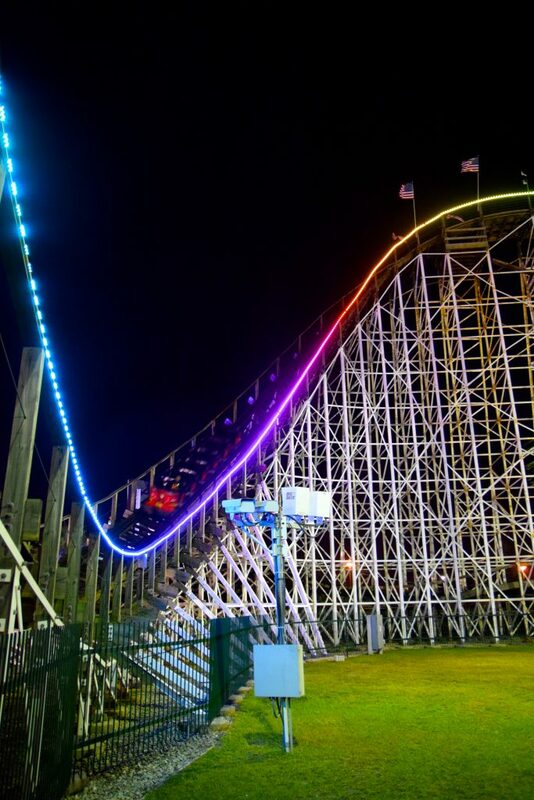 Which is beautifully lit up with red white and blue flood lights! There are the tiny Timberliners (trains) chasing down the first drop. 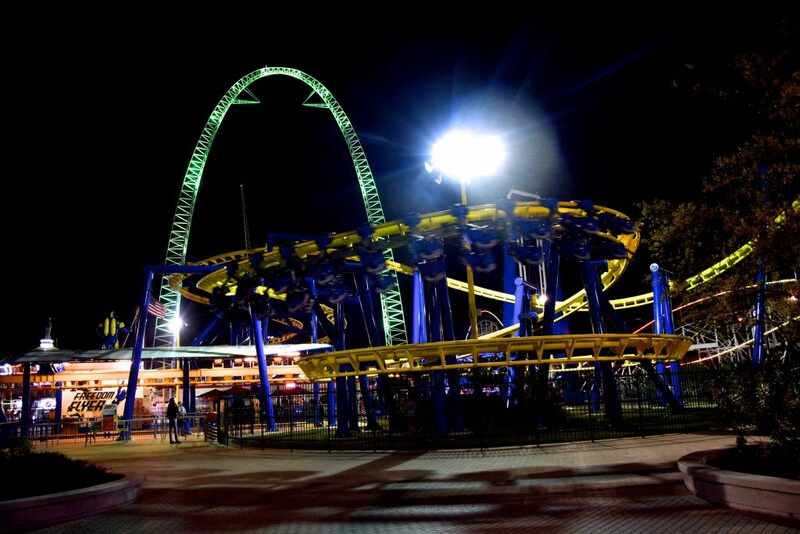 The coaster is very compact, and mixed reviews are out there, but we were instantly hooked! What a fun little wild ride! 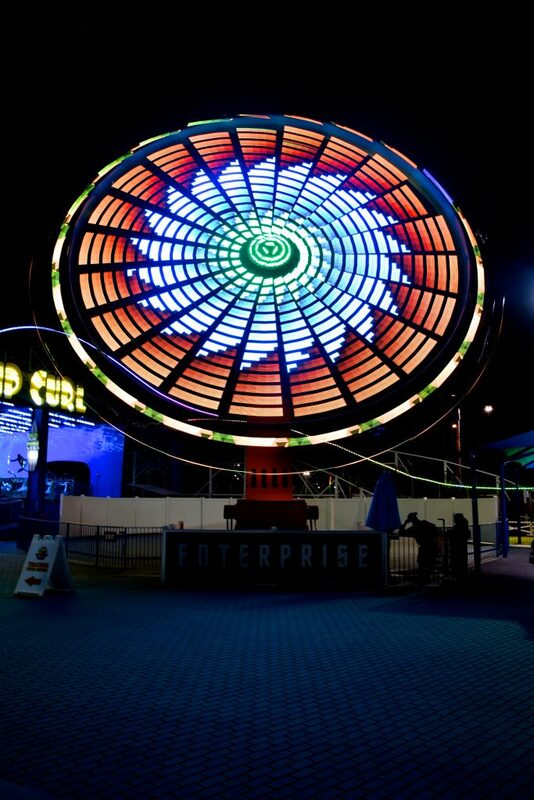 The ride’s signature element is the zero-G-roll, through which it rushes at a wonderful speed! The super structure is very strange but allows for great views off-ride, as well as on ride! There’s a slight moment of hang time, followed by an insanely fun high-speed layout that Mine Blew us away. It’s hard to imagine a small park like this having such a stellar wooden coaster, we really enjoyed the ride. ‘Til the very last airtime hills Mine Blower manages to keep the ride fascinating and fast-paced, with some fun lateral moments, and surprisingly much airtime. This was Alex’ 850th coaster, and he wouldn’t have it any other way. 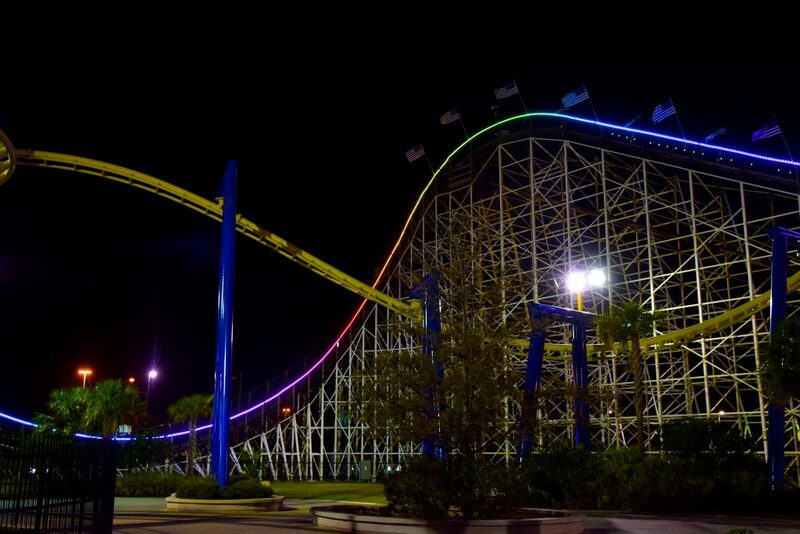 Besides the park’s fun atmosphere and amazing staff, this ride should draw you straight to Kissimmee when you’re in the region! 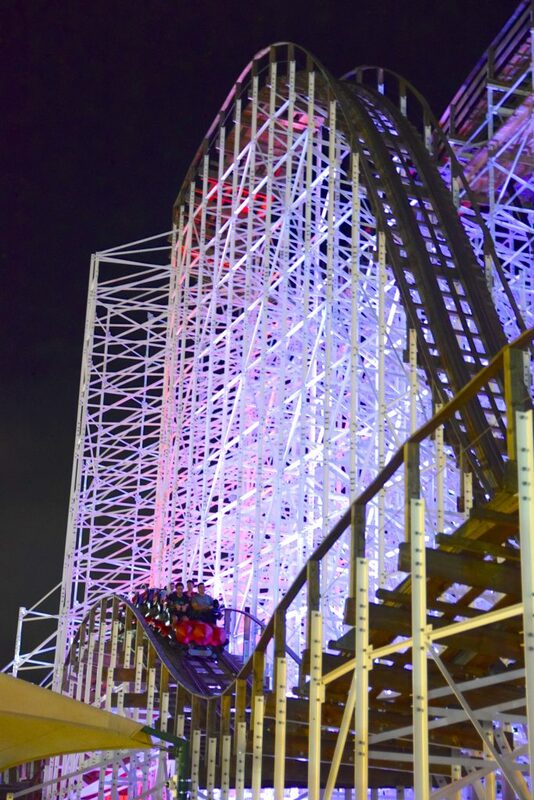 Here’s a last look at America’s newest inverting wooden coaster. 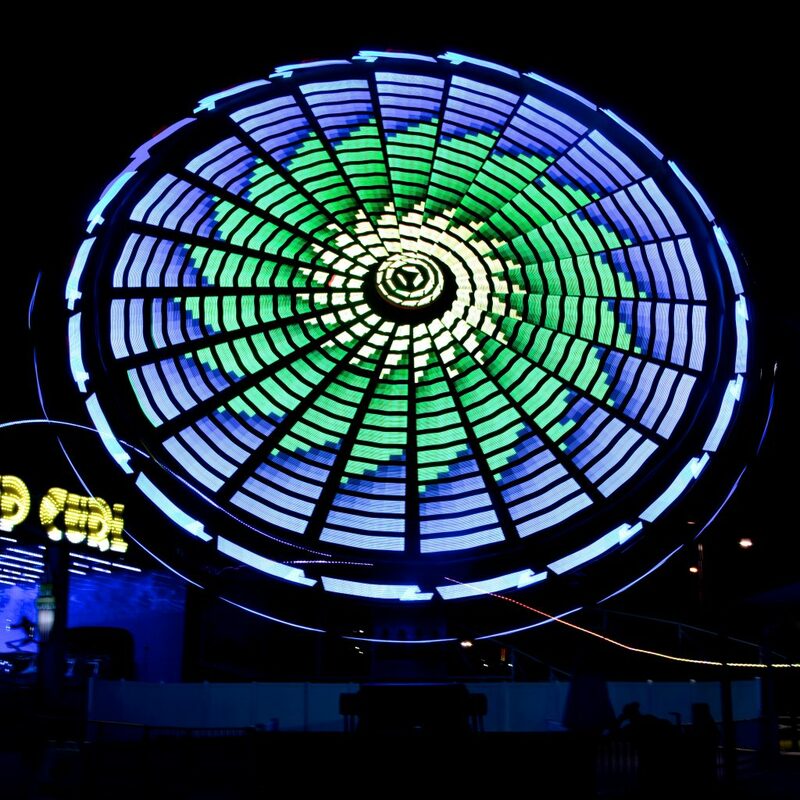 It’s just a few minutes from Walt Disney World and SeaWorld Orlando and is THE perfect nighttime ride once you finish your day at the region’s mega parks! One of the most terrifying things on earth shares the same grounds! 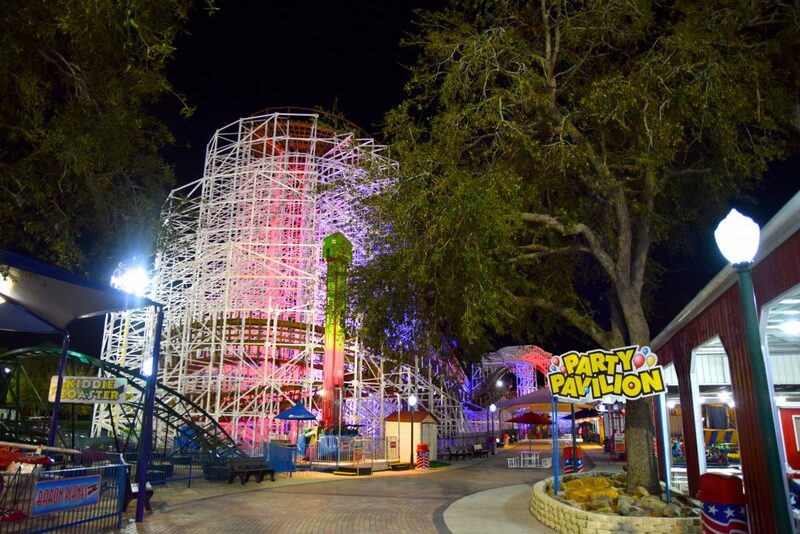 The park’s Sky Coaster is over 300 feet tall, making it the world’s tallest Sky Coaster. It occupies almost the entire park and has a beautiful presence in the region’s skyline. 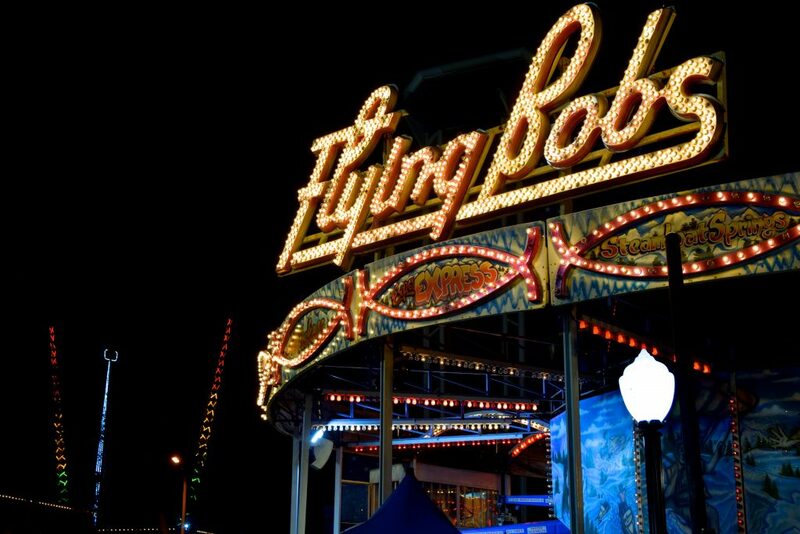 We’re about to ride that monstrous Sky Coaster, but first things first, the park has amazing classic fair rides like the Flying Bob <3, which is located across the park’s Go Kart tracks: Vortex. The park is cozy and located beautifully around this beautiful small lake. 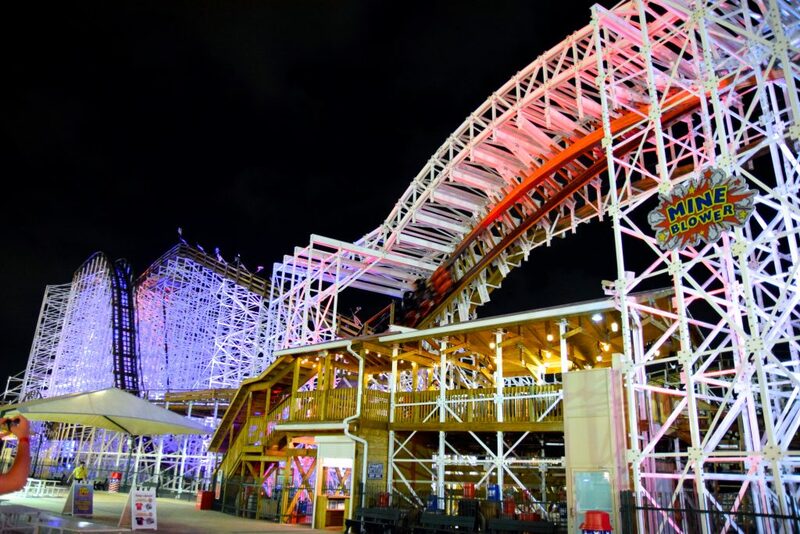 Look at that beautiful new wooden coaster! 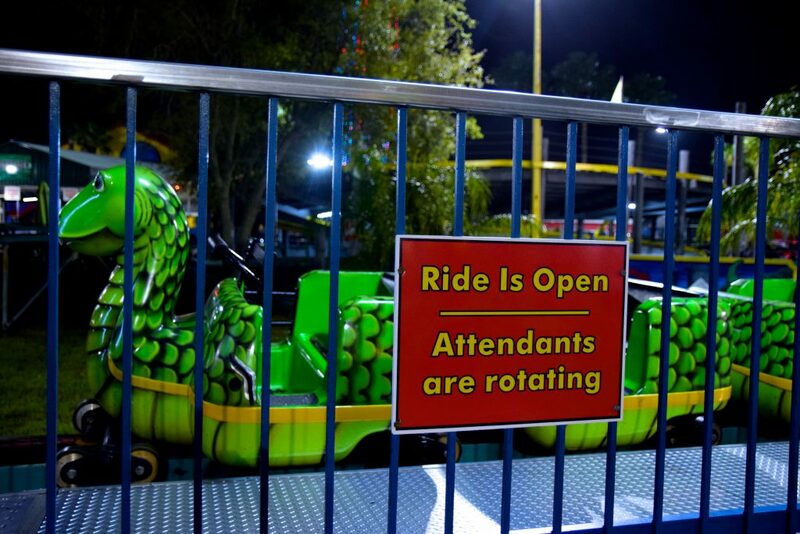 Other rides in the park are a swing ride, Bumper Cars, a kiddie coaster, and an inverting pendulum ride! 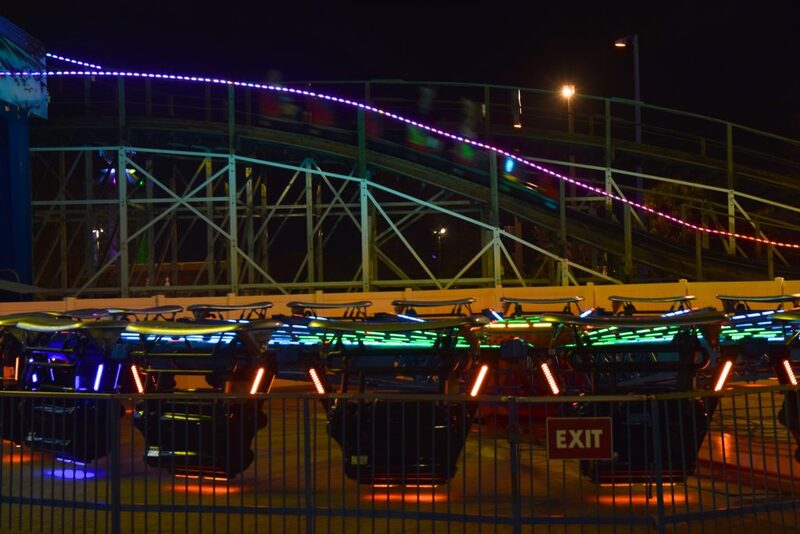 Here’s a better look at that pendulum ride from the boarding area of the terrifying Sky Coaster. 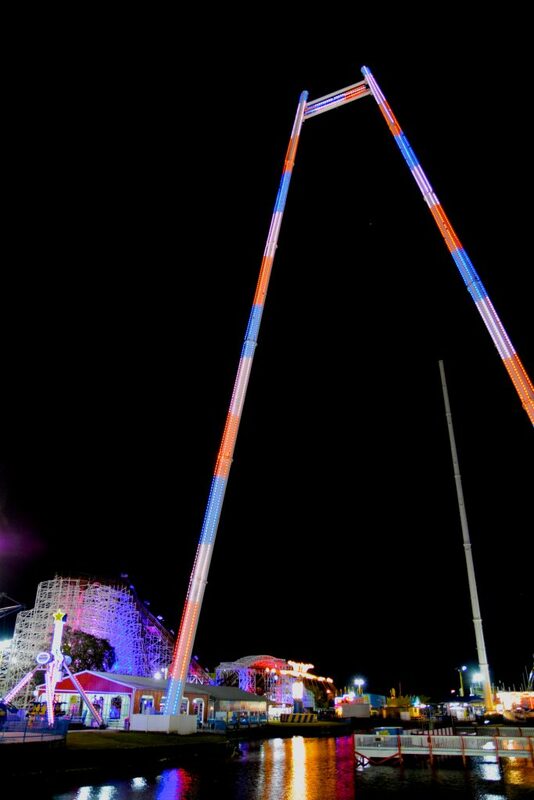 We were both quite nervous getting on, and especially the 300 foot drop prior to the cable reaching tension point was truly terrifying. 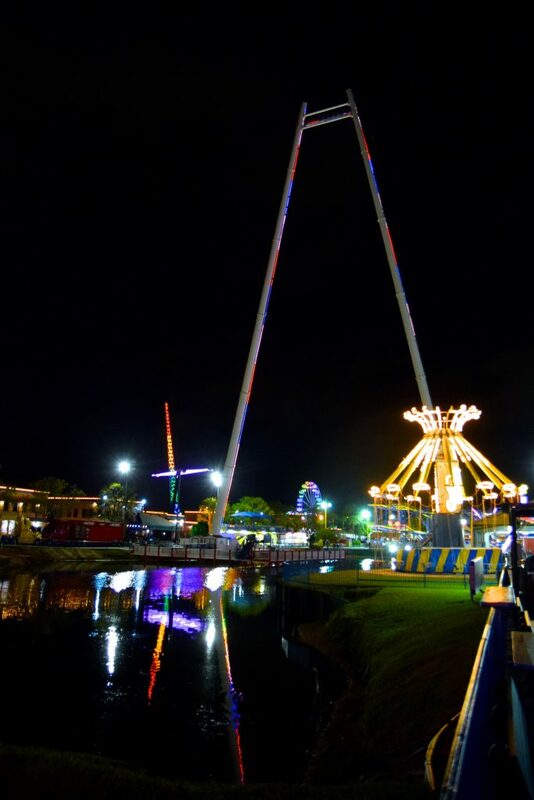 The park’s Sky Coaster is such an amazing attraction that you can’t understand the sheer size of it ’til you fly by in an airplane, or hang up high in the sky on the actual ride. This was such a fun experience I would do it again in a heartbeat and advise anyone visiting the park to check it out. 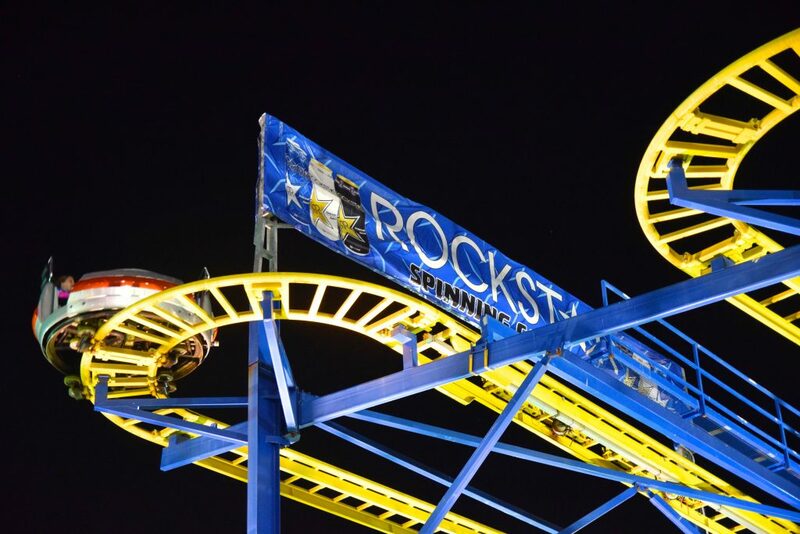 After the breath taking Sky Coaster experience, we decided to mellow out with Rockstar, their Zamperla Spinning Mouse coaster, which was very smooth, well-maintained, and spun quite a bit! 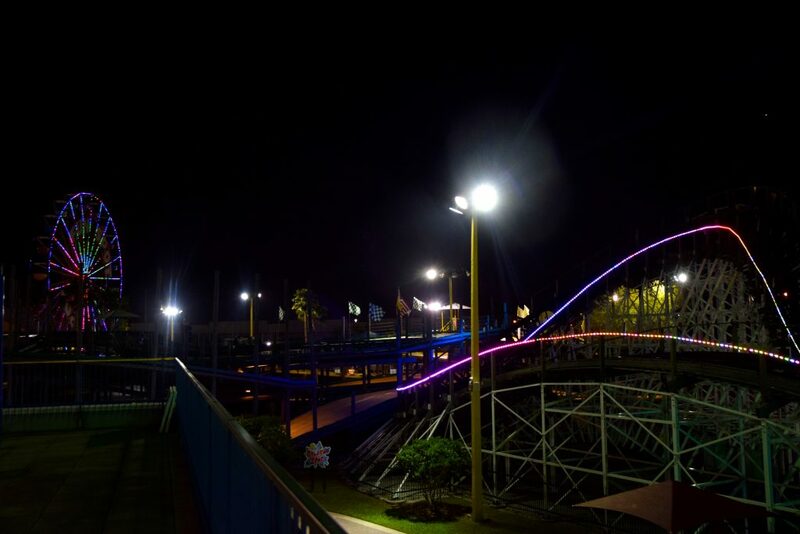 Though it’s no longer the star-coaster at the park, it’s a can’t miss ride when at Fun Spot Kissimmee! After our splendid visit to Fun Spot Kissimmee it was time to visit the better know park of the two, Fun Spot Orlando, on the other end of the infamous I-Drive. 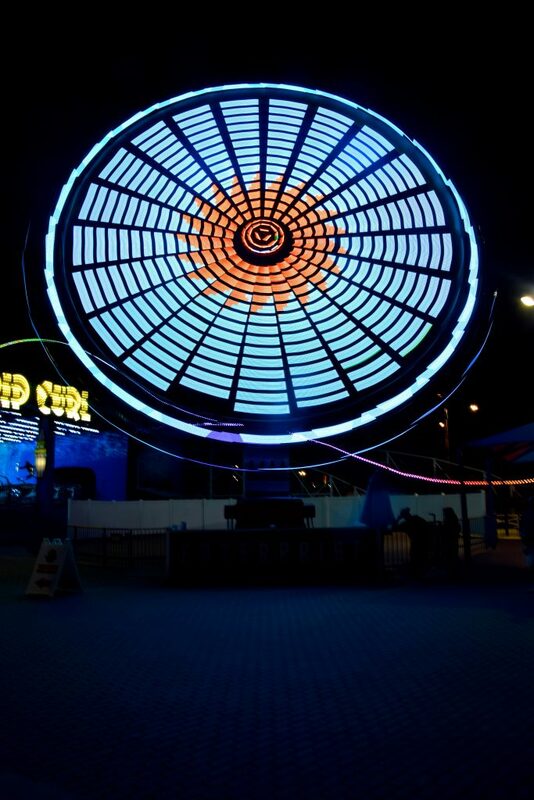 The park is famous for being so closely located to major Orlando attractions like the Universal Orlando resort, the Orlando Eye, and other I-Drive attractions. 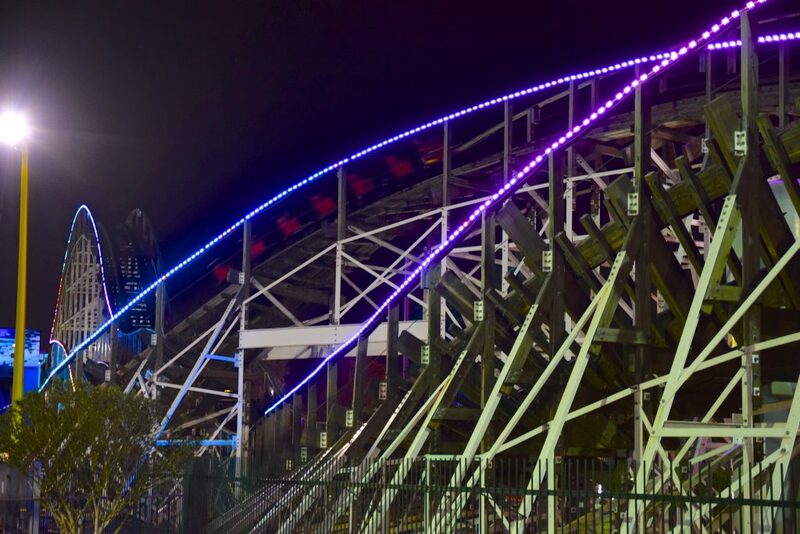 The park went from Family Fun Center to full amusement park in 2013, when they added three coasters at once, including White Lightning and Freedom Flyer as seen in the picture below, which are their 2 bigger coasters. 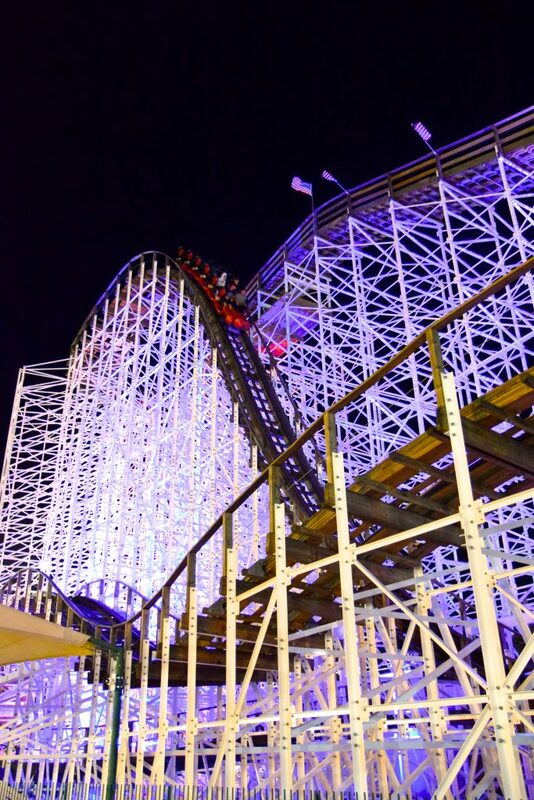 White Lighting is a GCI wooden coaster with a splendid out-and-back layout with some great airtime. 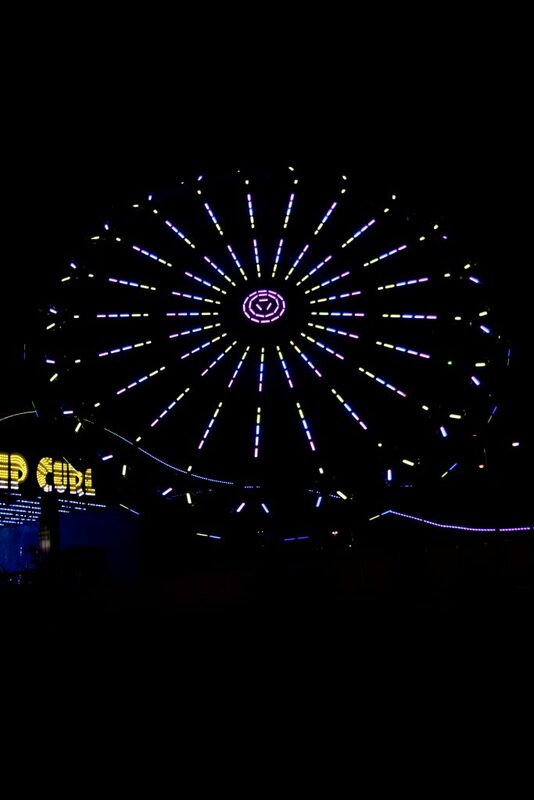 The light package on the ride is phenomenal too, clearly. The ride has very short vehicles and runs very smoothly, it runs especially fast in the summer months, something I look forward to trying out soon. Freedom Flyer is the park’s Vekoma Family Inverted Coaster, which is incredibly smooth, and had quite some impressive speed to it. The ride currently offers a VR option, but we chose to rode in original style. We’re kind of past VR coasters by now. 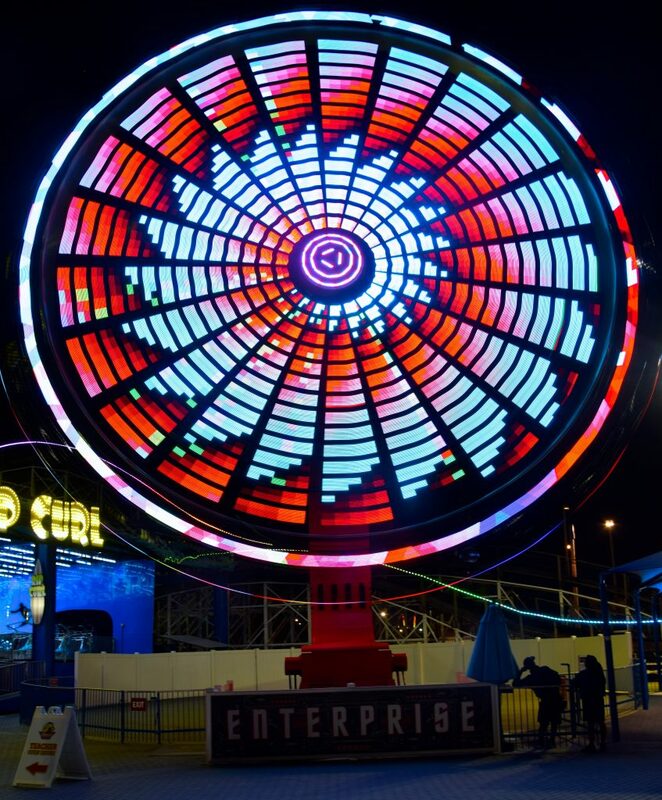 One of my all-time favorite rides is an Enterprise, the park acquired wheelie from Six Flags Over Georgia and retrofitted it with amazing LED lights, more pics later on! 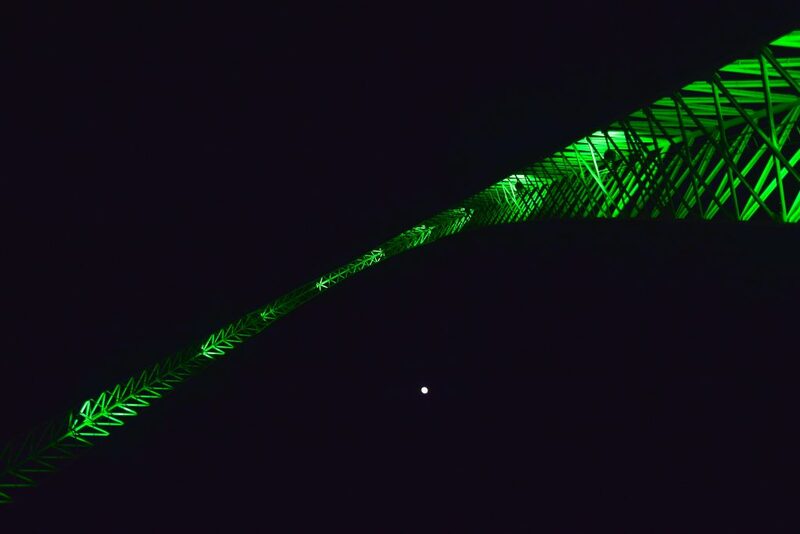 The park is particularly stunning at night, which is why we were so excited to check out these parks in the dark, both were open ’til midnight! The ride experience on Enterprise was awesome. It runs a great cycle that completely inverts you 180 degrees (unlike some other Schwarzkopf Enterprises in the US), and is nicely maintained. The original end of the park features the arcade, Ferris wheel and Go Kart tracks, it’s very impressive how much park they added in the past few years! After riding the 300 feet all Sky Coaster at the Kissimmee park, we were actually very excited and no longer nervous to check out the 250 feet tall Sky Coaster at the Orlando park! At the Orlando park it also flies over water, though a smaller pond than in Kissimme. 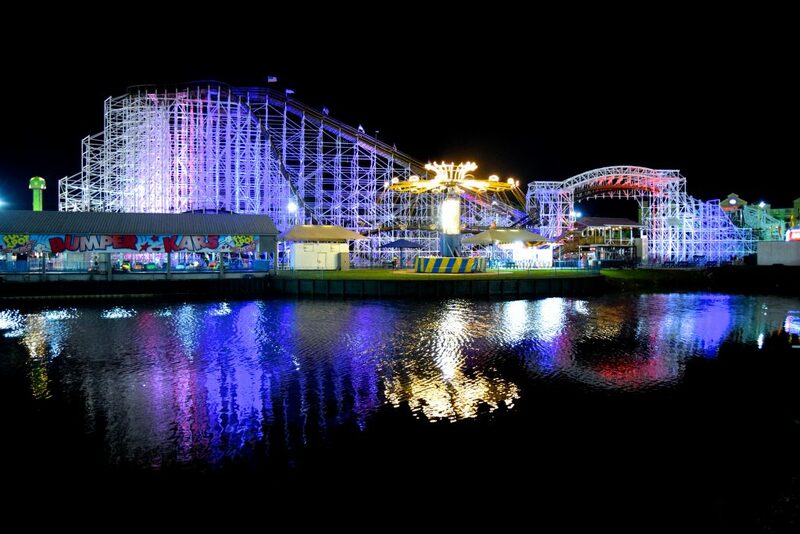 The Orlando park has quite some rides which really makes this a very stunning Sky Coaster to be on. 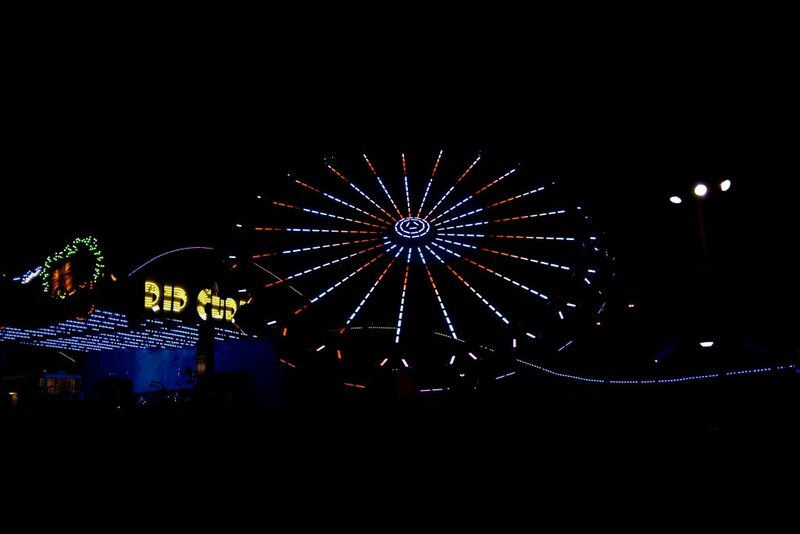 Besides my love for Star Trek, which comes into play with the ride’s logo, I’m also a big fan of nice light packages. 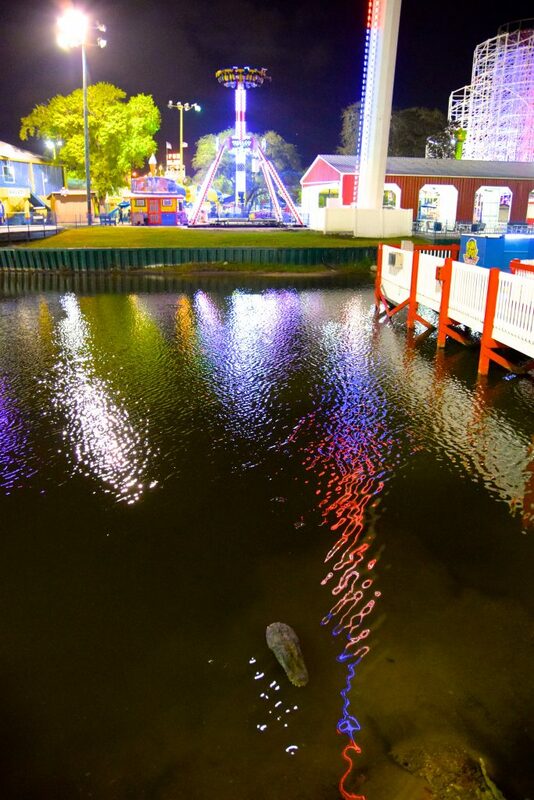 Something Fun Spot knows all about. 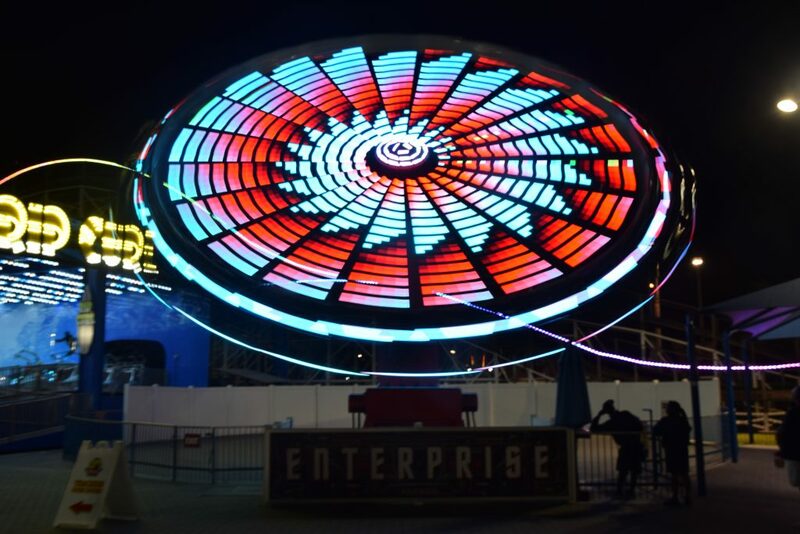 We took a solid set of long exposure shots of Enterprise, and decided that was the perfect thing to end this Fun Spot report with! IT IS SO BEAUTIFUL! The staff at the park really enjoyed us taking pictures and writing about our experiences. 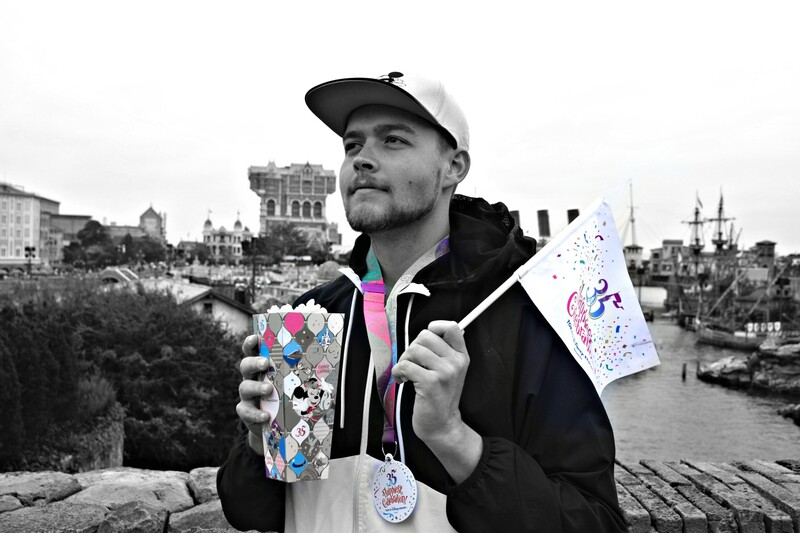 Shout out to the amazing staff at both parks! The pictures almost look surreal! 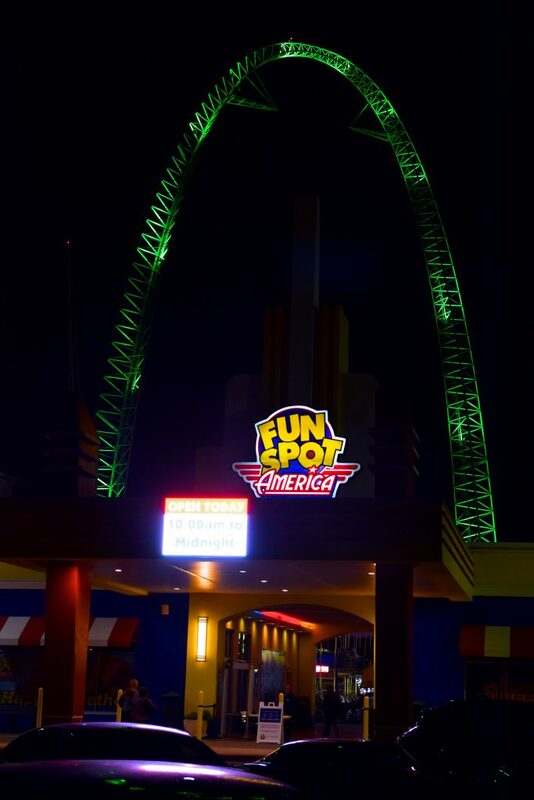 One last shot <3 – Thanks Fun Spot America for hosting us! We had a fantastic time and will be back soon!